I rarely get sent guitar related gadgets to review, but when I was contacted by Garrett McCluskey about his new invention, the Distressed Wristrest (Wristrest for short), I was immediately intrigued. I had seen similar "rests" before, but none as adjustable and unobtrusive as this one. A few email exchanges later and I had received my very own custom made Wristrest. You can read my own personal thoughts further down this page. 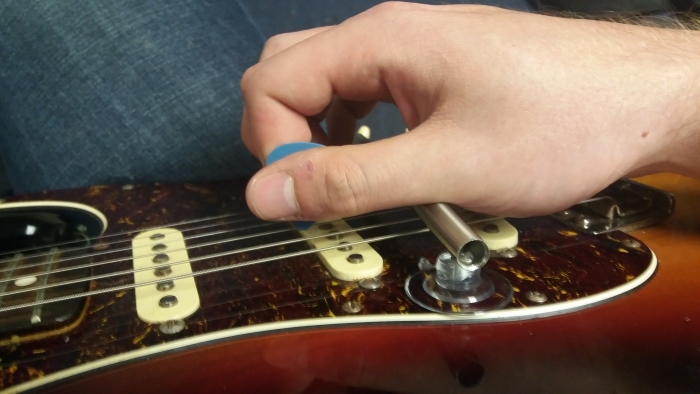 But first, what exactly is the Wristrest and how can it help you as a guitar player? As the name suggests, it provides a resting support for your pick-hand wrist over the strings. Garrett's main aim, when creating the Wristrest, was simple: to reduce the physical inefficiencies involved in picking - to accomplish more with less effort. 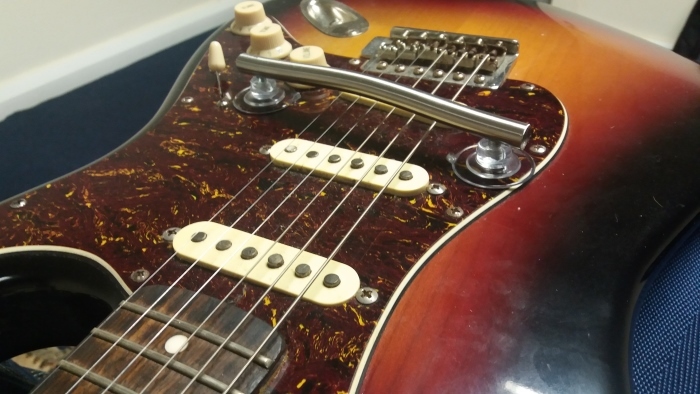 While the body of your guitar will give your forearm support, many players, especially those with wrist problems (which we'll address in a moment), find forearm stability is insufficient for accurate, quick and consistent picking for prolonged periods. The Wristrest gives you support directly above the strings, meaning less energy and tension is expended on trying to maintain a consistent pick height as you move between strings. This extra stability and efficiency translates to significant benefits in terms of picking speed, precision, consistency and endurance. Increase the amount of time you can play without fatigue. Improve consistency, precision, and accuracy. Reduce effort expenditure, or in other words, increase efficiency, thereby making you a more streamlined guitar-playing machine. And, best for last… it can increase your speed. Players who experience excessive tension in their wrists will know that it can be a serious inhibitor to your picking endurance and precision with moving from string to string. Practically speaking, the more tension you have in your wrist, the less control you have over your pick-hand movement and the sooner fatigue sets in. For guitarists, tension is the enemy and being able to relax is a crucial element in maximising endurance and getting up to speed. But we're all built differently, and I've received many emails from players who simply cannot get their wrist to relax when picking at higher tempos, as if it has a life of its own. As well as the short term obstacles this throws up, there are potentially long term problems that can arise from constant, excessive tension in the wrist. The two most common problems associated with this are tendonitis and carpal tunnel syndrome, which can develop gradually over many years until the point where pain signals there's something wrong. The Wristrest can help relieve tension, and therefore reduce the risk of tension-related problems further down the road, by providing that extra point of support over the strings. This device allows the fulcrum of your lever, so to speak, to move from the wrist to the elbow. One's wrist can literally fully relax when everything is in order. Another symptom the Wristrest can potentially alleviate is shaking in the wrist which, again, is exacerbated by tension. By providing a stable resting point for the wrist over the strings, less compensation will have to be made by the body to keep it in a fixed position. The WR is custom designed for your guitar and is shaped to match the radius of the guitar's neck. On most guitars, the middle two strings (3 and 4 or G and D in standard tuning) will be set the highest from the neck, with the two E strings (1 and 6) being set the lowest. This is because fretboards tend to have a radial curve to them. The WR is made to match the listed neck radius measurement for the make and model of your guitar, ensuring that the player's pick height varies automatically in accordance with the string height. However, some guitar fretboards have a flat radius, and the customised design of the WR means it can also accommodate these types of guitars. 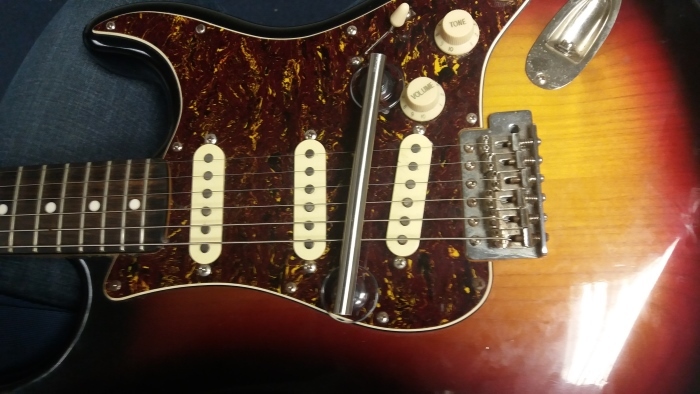 You can also adjust the overall height of the WR by turning the suction cups in a similar way you would raise or lower each end of the bridge on Tune-O-Matic style guitars (e.g. Les Pauls). What this means is that your wrist will always be positioned at the optimum height as you move across the strings, aiding picking precision and consistency. There'll be some experimentation as you adjust the WR to find the sweet spot. But once there, you'll have the support you need to pick accurately without having to unnecessarily expend energy (and therefore create tension) maintaining the pick-hand's distance from the strings. As many of us will have experienced, set your action (string height) too low and you'll hear excessive buzzing (known as fret buzz) as the vibrating string makes contact with the frets. 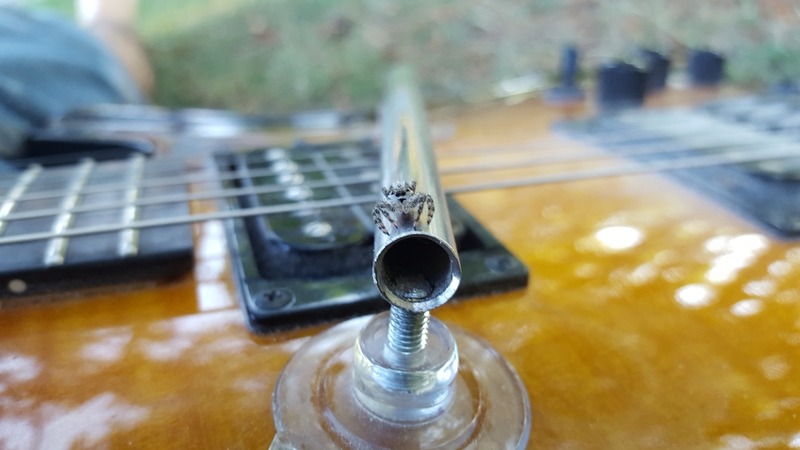 Buzzing is further eliminated and action further lowered through WR implementation if one reaches the point where their picking is light enough to keep the pick at a 90 degree angle to the strings. 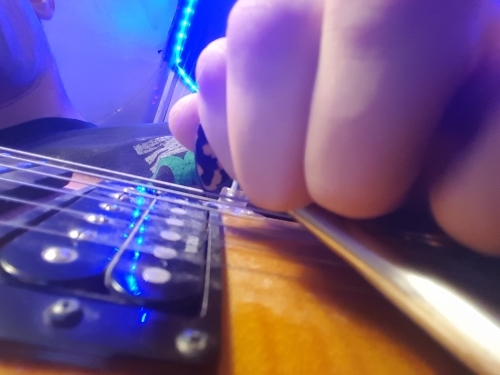 Most guitarists lean the pick forward to play downstrokes and backward for upstrokes to avoid getting caught on a string, but that is only an issue if your pick is liable to vary excessively in height. An angled pick is an inclined plane, so it causes the vibration of the string to be one that is not strictly back and forth, but also somewhat up and down, elliptical. We all have our own ways of playing the guitar. When trying the WR, I had to consider how others might use and benefit from it. It took some time to adjust my picking technique, as expected, since I was used to only having support from my forearm on the guitar body. But after a couple of weeks, I could feel how the WR could potentially help those with excessive tension in their pick hand. There was noticeably less tension in my wrist once I'd found the correct positioning and learned to just relax and let the WR guide my pick hand. You'll need to spend some time finding the optimum position for the WR and where your pick hand sits on it. It'll be different for everyone. The optimum position for me was to angle the bar slightly and rest upon it the upper part of my thumb. This allowed for smooth, unobstructed movement across the strings. I rest my index and middle finger nails on the WR so as to even further reduce resistance. Stainless steel is smooth, but skin can still get "caught" on it, causing erratic/unpredictable rates of acceleration and deceleration. I've personally never felt comfortable with the fist technique as a general pick holding method, but I know many guitarists use it. 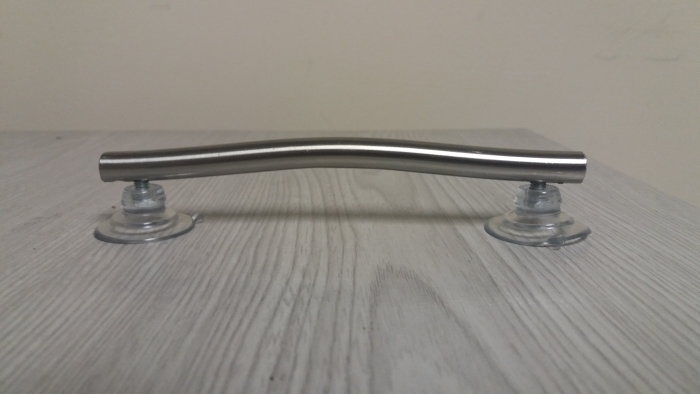 For me, resting my thumb on the WR bar felt the most natural position, even though it perhaps caused slightly more friction than using the fingernails as the contact point. The suction cups worked better than I expected. They held the device strongly enough that I could only remove the WR by peeling the cup off, rather than pulling it. The height of the WR was easy to adjust - just twist the cups to screw or unscrew, raising or lowering each end. Palm muting was still achievable, simply by resting back the wrist until contact with the strings was made at the bridge. All in all, I felt the WR accomplished what it was designed for, but the players who will benefit from it the most are those who have tension and/or shaking problems in their pick-hand, or struggle with poor pick control and are willing to change their playing habits and try something new. Beginners may also benefit in the same way we benefit from stabilisers when learning to ride a bicycle. There may come a point where the WR can be removed and it will have served its purpose. Garrett, however, insists that no matter the level of aptitude achieved, the WR will continue to be indispensable for ensuring consistent execution that only sound mechanics can provide. For those with longer term pick-hand issues, who have exhausted other solutions, the WR could be exactly what they need to get playing lead guitar again with confidence and competence. Learn more about the Wristrest, and the man behind it, on Garrett's site here. Have any questions or thoughts? Let us know using the comments form below.